Legacy 2030 | Winston-Salem/Forsyth County Planning Board: What's Durham doing? 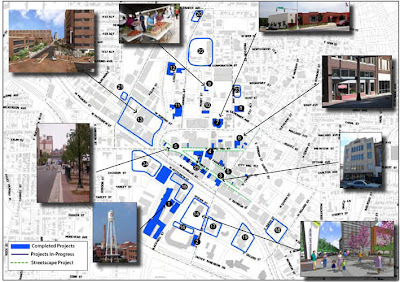 Durham’s downtown plan, the Downtown Durham Master Plan, has five overarching themes. The plan proposes making downtown the city’s focal point; easing connectivity between downtown areas and the surrounding city; encouraging residential infill development; continuing public sector investment in downtown; and enhancing the capacity of downtown organizations such as Downtown Durham, Inc. In addition to these themes, the plan identifies development focus areas and “catalyst projects” which have the best chance of having a positive impact on downtown.